North America will be in range. SSTV signal using a handheld and a rubber duck antenna. heard a weak voice before LOS! It sounded like a recorded message. SSTV strong signal, S9 + over 40dB at 23:12-23:22UTC, 30 Jul 2011. ARISSat-1/KEDR and ISS. SSTV, voice msg and voice tlm were heard. a classroom environment with minimal set up. transmitted callsign will be RS01S. The mission was specifically designed as an education-based satellite. by Phil Karn, KA9Q to be readable in low signal level conditions. this indicates the backup of BPSK-400 format is being transmitted. telemetry and KURSK experiment results. + If you are running ARISSatTLM and receiving the signal "live"
from ARISSat-1/KEDR, please enable the telemetry forwarding option. cell phone. (leave off the quotes). linear transponder passband between 145.922 to 145.938 MHz. SSTV, BPSK-1000 or BPSK-400 downlinks. from both your 2 meter FM radio and 2 meter SSB radio. can be run to the soundcard 'Line In' connection. mitter to the soundcard and to control the push-to-talk functions. and data from the Kursk experiment. 1. You need a 2 meter SSB receiver. Guide to install the software. ARISSatTLM requires the recorded data to be in the WAV format. ARISSatTLM are a "matched pair"). 1. Start the ARISSatTLM program on your computer. File --> Open WAVE file. Select the ARISSatTLM test file you previously downloaded. proper location (note the "Put CW signal here" indicator). 8. The display will stop when the end of file is reached. spot where there's no BPSK signal power. you tune the signal correctly. copy the CW2 beacon text in the Morse Code Decoder window. 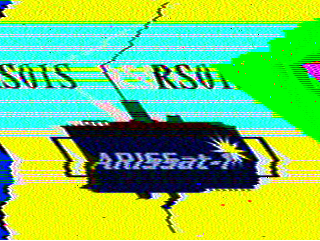 play the SSTV pictures transmitted by ARISSat-1. Robot 36 format on 145.950 MHz about every 140 seconds. to orient the whip to line up the antenna polarization. the center part of the bar. MMSSTV will give you an "overflow"
indication if the volume is too high. The Ham Radio Deluxe software package also includes SSTV operation. interesting projects I've ever worked on." deployed on the ISS? Tune in and see! then follow the EE Life -> Blogs link for future installments. documenting their participation in science activities and projects. This is a short video showing what happens during a 'high sine' test. The test is being performed in the Z axis. Hold your breath!! Heil and Gordon West" show in Leo LaPorte's TWIT.tv network. sion in Perris, CA on August 4 and in Rialto, CA on August 20. ALL are welcome to attend these club meetings! tions. There is a high elevation pass by AO-51 at 2026-Z (4:26 p.m.
EDT) within range of the special event. Rocky Mountain Division Convention. http://www.2011convention.org. will take place on CW, SSB, digital modes and via satellites. e-mail address can be found on QRZ.com. QSL via VA3ITA. Michael E. Fossum KF5AQG onboard the International Space Station. vide good coverage of the other ANS bulletin items we've issued. August 18, and September 1 at 8:00 PM Eastern Daylight Time (UTC - 4).